This Pyramid coin display is an ideal way to showcase your pride in your unit or country. Three grooved rows on four sides of a pyramid display made from the finest solid oak makes this coin display rack great for a desk, mantel, coffee table or show off it and the coins beauty on a pedestal. 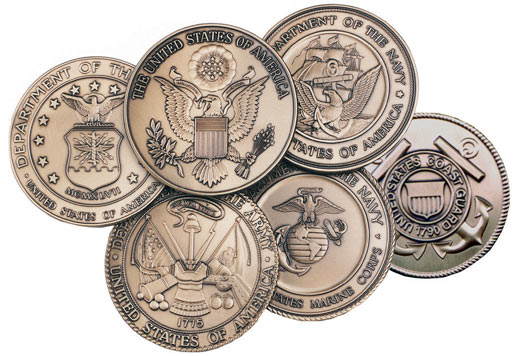 A great gift for a coin collector or military veteran. 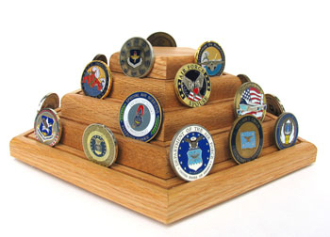 Made in the USA, this wooden display rack can hold approximately 60 coins (depending on challenge coin size) and can rotate fully (similarly to a lazy Susan) so all angles of the coins can be enjoyed with a gentle push. And at 12” (height) x 12” (width) x 4 1/4” it’s a great centerpiece or accent to any room of the home or office. Orders for the Coin Display, Challenge coin Display, Military Coin holder are usually shipped out within one business day to places within the USA and Canada. HIGHLY RECOMMEND, if you're a coin collector. Sturdy, spacious, beautiful are just a few words to describe this lovely piece. This Coin Display stand was a gift for my son and his wife. They were both ecstatic and it will be used for years to come. After using this Coin Display Stand for over two months now, I purchased another one this week as a gift for my mother. She’s very impressed since she’s tried other stands in the past that were flimsy and of poor quality. The material, craftsmanship and quality are impeccable and you can see that the moment you open the package.